Born in 1906 in Canton (Guangdong) Province, China, Gee immigrated illegally to San Francisco in 1921 at the age of fifteen. His father had secured citizenship after the 1906 earthquake and fire destroyed all the immigration and naturalization records, and this false claim also enabled Gee to argue for citizenship when he arrived in San Francisco. He began attending the California School of Fine Arts (now San Francisco Art Institute) in 1925 and soon became one of the school’s prized students, studying with Gottardo F.F. Piazzoni and Otis Oldfield, with whom he opened the influential Modern Gallery in San Francisco in 1926. 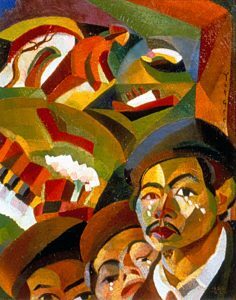 That same year he founded the Chinese Revolutionary Artists Club, which advocated a hybrid artistic vocabulary based on Chinese and modernist principles. The artist’s best-known painting, Where Is My Mother (1926-1927), addresses his shifting status as a peripatetic immigrant and modern painter. The painting’s subject matter is described in the poem that Gee wrote to accompany it, dated May 31, 1926. The poem begins: “That mother of mine, how it tore my heart / To leave her across the sea.” The artist depicts himself weeping, along with two Chinese women, in the lower right foreground of the painting. Above him a window opening frames a landscape background, in which his mother stands before a house and bare-limbed tree. Below her a row of buildings and a smokestack signal the industrial factories of modern life, while an ocean liner suggests passage to another continent. The painting’s poignancy derives from its kaleidoscope of memories and competing desires, its jumble of imagery evoking the familiar modernist theme of displacement. However, more than its theme, the painting’s visual language of fragmentation and dislocation marks it as a work that shifts between a Chinese subject and a Western avant-garde artistic vocabulary. The Cézanne-like breakdown of the picture plane into a rhythmic composition of elemental forms is combined with a Synchromist approach to pure color. Synchromism, an aesthetic philosophy developed in 1913 in Paris by the American painters Stanton Macdonald-Wright and Morgan Russell, was a visual language devised from the science of optics, blending Cézanne’s organization of space and Matisse’s use of color. Gee’s mentor, Otis Oldfield, returned from studying in Paris and brought to San Francisco his fascination with Synchromism. Gee adapted the largely abstract vocabulary of Synchromism to a more pictorial mode, wedding it to the fragmented representation of Synthetic Cubism. The painting also shifts between the genres of portrait and landscape in the two Cubist-inspired faces emerging from the background, which are evident once the factory buildings of the ocean liner are perceived as a mouth. Thematically, Gee represents the duality of emotional and physical displacement through the image of his torn heart, which is itself a fragment of his body. Gee’s painting Butterflies: Dream of Chuang-Tze (ca. 1930) reflects the three years the artist spent in Paris from 1927 to 1930. In it Gee replaces his earlier Cubist planes of bright Synchromist color with the more muted colors of Chinese ink painting and the fluid contours and dreamlike spatial organization associated with Matisse. In the celebrated Chinese literary narrative referenced in the title, the Taoist philosopher Chuang-Tze (Zhuangzhi) recounts that he awakens from a dream and wonders if he is presently a butterfly dreaming he is a philosopher. This basic conundrum of transformation lies at the heart of Taoist philosophy and illustrates the impossibility of fixing representation as a stable matrix of encoded meanings. In representing the ambiguous fragments and dislocation of the dream state, Gee explores the territory on which the Surrealist artists he was meeting in Paris relied. The sleeping form of Zhuangzi is rendered in the midst of transformation, his head resting against an impossibly configured shoulder and elongated arm. His body resembles an egg more than any recognizable anatomy, his leg and a monstrous red foot emerging from it as from a chrysalis. 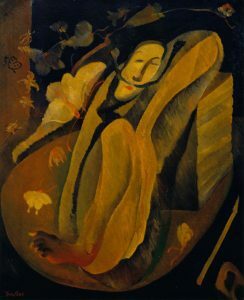 Around the sleeping figure, delicate flowers and leaves float, contributing to the impression that the spatial constraints of the scene are as tenuous as its temporal dimension. The noted historian of Chinese Art, Robert E. Harrist, Jr., asserts that this painting does not “look even remotely like Chinese pictorial art” in spite of its obvious Chinese subject. He explains that the tradition of guohua ink painting Gee had learned in China emphasizes calligraphic outlines, which are nearly absent in his work. The painting does, however, us a fluid vocabulary of pattern and design to indicate the body in flux. 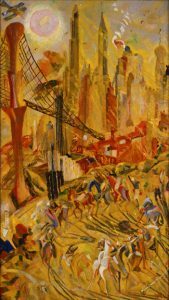 Gee returned from Paris to live in New York in 1930, and two years later exhibited Wheels: Industrial New York (1932) in the Museum of Modern Art’s mural exhibition. In this painting, the artist embraces the goals and techniques of Futurism, yet another of the West’s modernist languages, which celebrates the power, excitement, and speed of modern industrial society in the flux created by machines, urbanization, and violence. As a movement, Futurism was short-lived. An optimistic call for a complete break with past political and artistic traditions, it did not survive the darker implications of fragmentation and dislocation brought about by World War I. Nevertheless, the visual vocabulary of Futurism influenced postwar visual experiments, especially Expressionism and Surrealism, elements of which are evident in Gee’s large-scale canvas. In its depiction of New York, the painting presents the dynamic forces and constant vitality of the modern city through jabbing, staccato lines, intersecting planes, and the burning intensity of read and yellow hues. The diagonals of the sun’s rays and a prominent suspension bridge, the vertical thrust of buildings, and the whirling circles of horses indicate the city’s ceaseless industry. However, in place of the workers one might expect in the painting, given its title, Gee includes a circle of polo players, symbols of class privilege and tradition, as the agents of the wheel that drives the city’s energy. The artist’s vision of the modern city links past and future, tradition and innovation, celebrating the kinetic potential that arises out of the fragmentation of time and space brought about by industrial progress. Daniell Cornell is Deputy Director for Art and Senior Curator, Palm Springs Art Museum. 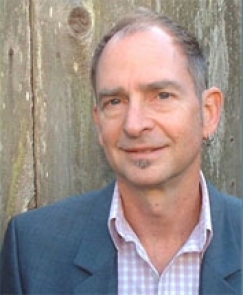 Cornell is also the Curator of American Art and Director of Contemporary Art Projects at the Fine Arts Museums of San Francisco.